Color theory is said to be the most important topic for anyone working with color. However, “working with color” is a very broad term, including both traditional painters, digital artists, and graphic designers. For each of these groups, the theory of color will mean something slightly different. Unfortunately, it’s the graphic designer’s description of color theory that has become the most popular and almost default. 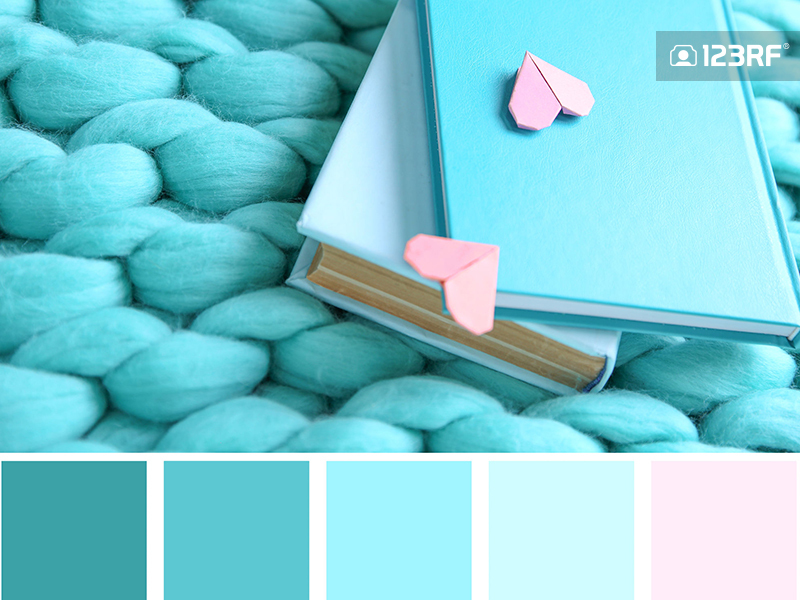 If you search the term on the Internet, you’ll learn a lot about the temperature of color, about the complementary hues, and how to create a consistent composition out of various color combinations. It’s all very important, of course, but if you’re a digital artist, specifically, you need to know more. The popular color wheel is, more accurately, the hue wheel. Hues are the types of color regardless of Brightness and Saturation. A red apple and a red cherry have the same hue, even if they have different colors. There are three primary hues that our eyes recognize: red, green, and blue. If you mix two of these basic hues, you’ll get secondary hues: yellow, cyan, and magenta. There are also tertiary hues, like orange or purple, but not all of them were given distinct names. Because the color wheel is a circle, the specific hues can be located by using their radial position: from 0 to 360 degrees. In Photoshop, red is used as a default beginning and end of the wheel—0 and 360 degrees. But Hue isn’t enough to create colors. If you only use hues, your picture will look unnaturally bright and pretty unbalanced to your eyes. Besides, you’ll most likely not be able to find brown or black between the hues, no matter how hard you try. It’s because there’s more to color than hue alone. Each color has also Saturation and Brightness. Imagine the “base” of color: a flask with clean water. Such a color has 100% transparency and 0% Saturation. If you add some Hue to it, the Saturation will increase. The more Hue you add, the more saturated the color will appear until it reaches 100%—100% of color and 0% of transparency. Brightness is based on an even simpler concept. Imagine the same flask in light and shadow. If there’s no light around (0% Brightness), the color will appear black. The more light, the brighter the color, until it can’t get any brighter (100% Brightness). It’s important to notice that Saturation and Brightness affect each other. When you desaturate a dark color, it will become dark grey, not white. White, therefore, is 0% Saturation combined with 100% Brightness, greys—0% Saturation combined with various levels of Brightness, and black—0% Brightness regardless of Saturation. Black, white, and greys are therefore not Hues, but special no-hue colors. Such a color-cylinder can be imagined as a kind of a “Rolodex”, where every sheet is a pool of shades belonging to a specific Hue. And it’s exactly what Photoshop shows you in its Color Picker panel! You can switch between Hues by adjusting the colorful slider on the right. Then you can increase the Saturation by moving to the right and increase the Brightness by moving up. But a lot of other programs made for digital painting show you not a square, but a triangle as the pool of shades. How do you read it? It’s only a little more complicated—you switch the Hues by moving around the rainbow ring, and you increase Saturation and Brightness by moving towards the “pure color” tip from the top and bottom respectively. But there’s one more thing, one hidden component of color: the Value. It doesn’t have its own slider, but it just as important as all the other components. It comes from the fact that the Hues are not equal to our eyes. We are more receptive towards greens, and less towards blues. Therefore, green appears brighter than blue to us. This is something you can’t change—100% bright blue is only as bright as 18% bright green! Values become clearly visible once we desaturate 100% Bright colors. A color wheel turns into a greyscale wheel, with various shades of the same Brightness and Saturation. How come? Well, the answer’s pretty obvious, once you think about it. White light is comprised of three components: red, green, and blue. White is the brightest of colors, 100% bright of Value. Therefore, red, green, and blue must all have lower Value that sums up to 100. And that’s what really happens: red has 30% Value, green has 59% Value, and blue has 11% Value. It’s a fact observed from reality, something that no slider can change. Why is it so important? Many beginners have problems with muddy colors or shading that looks washed-out. This comes directly from ignoring the existence of Value. Intuition tells us that light makes objects brighter, and shadow—darker, but it’s only a part of the truth. Light makes an object as bright as it can be, not infinitely brighter. A red cherry doesn’t become white in light—it can’t get any brighter than 100% red. To solve this problem, you always need to keep the local color in mind. Local color has various meanings, but in our case, it can be understood as “the color that the object would have in a perfect light”. For example, for a cherry, it could be 70% bright red, only visible when there’s 100% light hitting it. Shadow will make it darker, but nothing will make it brighter than this. There are two exceptions to this rule. First, this only applies to 100% matte surfaces, which are very rare. Most surfaces have some shine to them—a thin transparent layer that reflects light in a clear way. This shine can produce a highlight—a silhouette of the light source reflected on the surface near (but not exactly in!) the brightest point. It can also reflect other objects from its environment if they are bright enough. The shinier the surface, the sharper the reflection. This is the only point where you can lower the Saturation to make the local color brighter above the limits of its Value (just keep in mind that the local color doesn’t really get any brighter—it’s the shiny transparent layer that covers the color with its reflected brightness). Another exception is the rim light. Even a dark, matte surface can become almost white when hit with a strong light at a correct angle. Rim light can be a great way to accentuate the form of a dark object—just remember to use little of it, or the image will look over-exposed! Last, but not least, there’s one more fact that you need to keep in mind all the time when picking colors. Colors aren’t real—they are produced by our brain as an interpretation of certain signals. Because of this, we can recognize the color of an object even when the light conditions change. 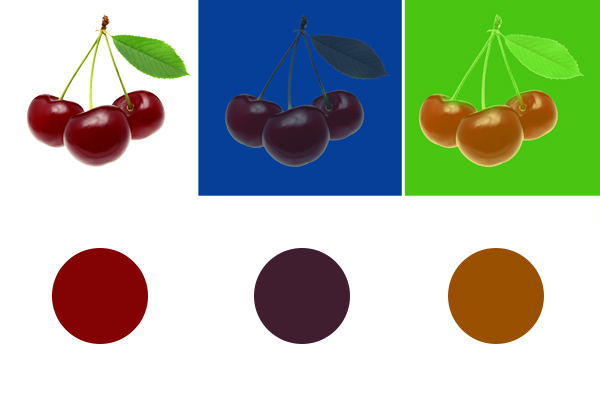 Check it out: All these cherries are seen as red, even though the color picker doesn’t agree with it. This means that colors are relative—we don’t see them separately, but as a whole. A shade appears red when it’s “redder” than its neighbor, and bright when it’s brighter than its neighbor. Don’t believe it? Just look how different these two identical greys seem. This simple fact turns the color picking into a very complicated process. When painting a red cherry, you can’t just pick any red—it must be a shade that fits the whole scene. Digital artists, however, have it easier than traditional painters. Let me show you very briefly what I mean. The key to a good, balanced composition is the correct handling of the components of a color. Our brain gives each of them a different priority—Value is noticed first, then Brightness, Saturation, and Hue. But even though Hue comes last, we usually prioritize it when creating our painting: we think about the red dress, blonde hair, green scales. But it’s what we should end up with—not begin with. Your brain uses Value to see the shape of the objects. Then it uses Brightness to analyze their 3D form. Later it searches for spots with high Saturation because they’re rare and therefore can give you some important information (a vividly colored spot may mean fruit… or blood). Only then Hue comes into consideration, to understand the details of what we see. And that’s how we must approach painting if we want to keep it all consistent. Let’s paint these tomatoes as an example. They are red, of course, but not just one shade of red. What should we start with? First, we need to remove all the light effects: the specular reflection and the shadows. What local colors would the tomatoes have, were they 100% matte and perfectly illuminated? For practice, let’s start with values. It’s not necessary if you have a reference, but when you want to paint something completely from imagination, picking the correct values is essential. You can practice this skill by painting values from a reference. So, look at the photo and imagine the local red and green of these tomatoes with no light effects. How bright would they be? Deep red like this will require quite a low value, and the green, though usually bright in value, is dark here as well. Let’s add some shadows now to reveal the form. If you look carefully, you’ll notice there are no black shadows in the photo. Even the darkest parts are still quite bright. Beginners often feel tempted to use all the shadows they have—straight to the black, but it leads to an artificial effect. Use only as many shadows as necessary to reveal the 3D form, and leave black only for the tightest crevices. Now we can safely add the hues. In Photoshop, you can paint the hues on a separate layer and change its mode to Color. This will mix the hue with the value beneath, creating a full, shaded color. Can you see how soft these tomatoes look? It’s because they’re so matte. But real tomatoes are not matte—they’re quite reflective, although in a “soft” way. This means you can add some brightness to them: pick the local color, give it more orange Hue (if the light source is warm), increase its Brightness, and lower its Saturation. But a reflective surface reflects more than the light source—it can, for example, reflect the bright sky and the bright ground. You can add these reflections the same way as before. Just shift the Hue and Brightness towards the values of the reflected color. Don’t forget about the “shadows”—dark elements don’t get reflected, but the lack of their reflection looks like shadows. Don’t forget to blend it all nicely! As you can see, a proper application of color theory let us paint beautiful, realistic tomatoes. When it comes to painting, intuition isn’t always enough—your creativity must be supported by knowledge.